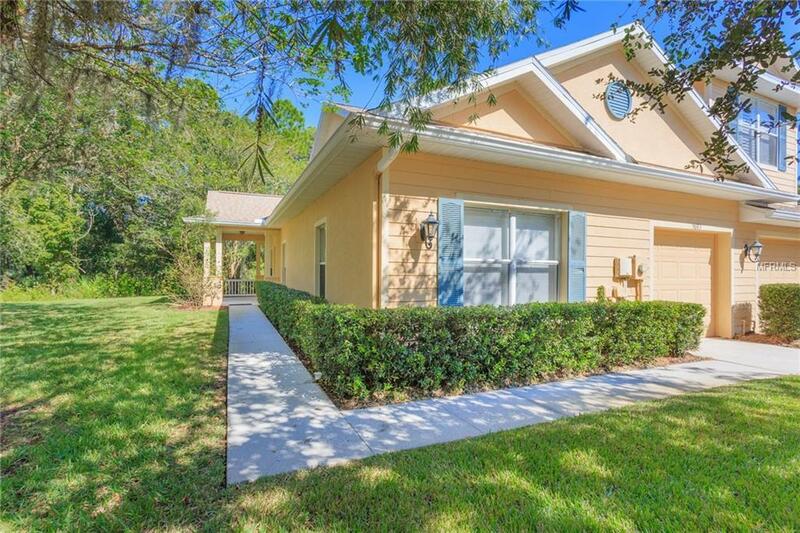 Live Oak Preserve is a guard gated community located in New Tampa and beautiful maintenance free Villa, built around the best top rated schools. Nice conservation area view from the great room and master bedroom. This beautiful property has 2 spacious bedrooms; in one of these, big windows fill the space with natural sunlight; the secondary bedroom, also with big windows is located in the front home to allow for ample privacy. Master bathroom with two vanities. One car garage. This property can fit your family and lifestyle. The great room and kitchen flow provide a large casual dining area just steps away from the covered large porch. The kitchen offers: Stainless Steel Appliances almost new, update wood cabinets 42, and nice counter tops, breakfast/snack bar overlooking the Great Room. Roof replaced by the Home Owners Association in 2018. Exterior painting also by the Home Owners Association is being planned. Spectacular landscape throughout with outstanding and incredible amenities such as: a resort style community pool and water park area. Also a clubhouse with: fitness center, game room, playground, tennis courts, basketball courts, and walking trails. The community features also distinctive architectural style properties with a beautiful landscape, located close to the modern elegant Wiregrass mall with easy access to I-75 and many restaurants, commercial, hospitals, and many other services.